At the end of last week's FamilySearch Indexing tip, the Ancestry Insider gave a "pop quiz." The question was, "What year would you enter for the record shown to the right" from the 1900 U.S. Census? We received three very insightful comments. I'd have to record 1887. It looks like the numerals in 1886 are all the same size and the 7 was written larger and darker to make it clear that it was an emendation. We didn't even know emendation was a word, until our spell checker got a crack at it. The Insider claims he knew. And to prove it he waltzed in Tuesday morning and announced, "I received an emendation for bravery in the War!" Hee hee. We tittered behind his back, "So he started the war as a coward?!" 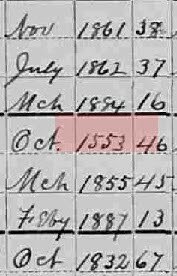 According to the project information for the Georgia census record (and it's the same for all the other 1900 census records I've done) you should use 1887 because: "Many fields may contain corrected or crossed-out information. ... When information is crossed out and then replaced, type the new data into the appropriate fields." We're glad you've carefully read the instructions and you're young enough to remember what it was you read. Some of us here at the Insider's office can remember back when we could remember things. Some of us just wish we could remember back to when we still remembered being able to remember things. The Ancestry Insider weighed in saying, "Because the emendation itself is the vehicle for emending the non-emended data, technically, the non-emendated data is not separately crossed out." While the Insider won't concede your point, we think you're right. Dino makes the case that the "7" was the correction. And even though the "6" is not separately crossed-out, writing over the top of it effectively crosses it out. Chad Milliner, a good friend of one of our staff members, concurred. "Truly, you have a dizzying intellect!" the Insider interrupted. He's so rude. Still, office protocol demands following a movie quote with the next line, so several voices answered in near unison, "Wait 'til I get going!" We challenged the Insider, "If you're so smart, what is your answer?" "If you had followed the link to the hint I gave," the Insider intoned superciliously, "you would have found that enumerators were to record the age at their last birthday previous to June 1st." The form itself only mentions recording the age at their last birthday. As we learned last time, the birth year and age add up to 1899 or 1900. Looking at the example to the right you can see that in months previous to June 1, the birth year and age add to 1900. For June to December, they add to 1899. "Since the child turned 13 in January, the year should be 1887," announced the Insider. While the Insider ended up at the right answer this time, he did so for the wrong reason. He should have finished reading Milliner's message because he may not always be so lucky. Milliner points out that entering something at odds with the instructions, is like "tilting at a windmill, since [you are] keying something different from the other keyer, and the arbitrator [will] side with what the other keyer used." Milliner further makes the suggestion that "FamilySearch Indexing [provide a] way for a keyer to note to the arbitrator why it was he or she keyed something the way he or she did." That's a good suggestion. Thanks, Chad.